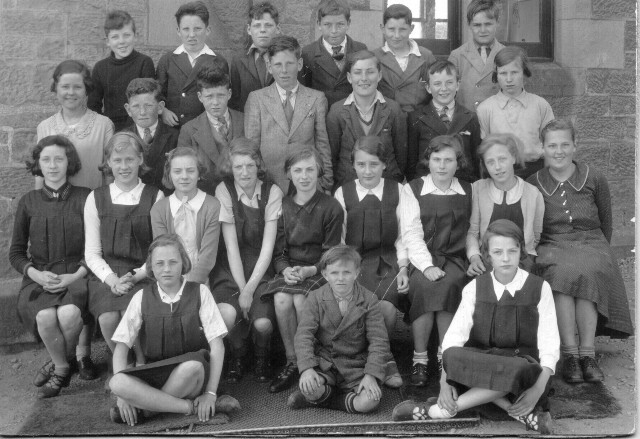 This photograph is of Invergordon Academy - a Class 1 secondary class with some Alness pupils, taken probably in 1934. It belongs to my aunt, Mrs Margaret Reid of Dunblane, who was then Margaret MacLennan from Kinrhive, the farm 6 miles north of Invergordon. She is in the 3rd row from the back, 2nd in. My father's sister, May Gammie, now May Fenwick, is in the same row, 6th from the left. The Gammies lived at Caplich farm, Alness. May and husband Ken now live on the Black Isle. Iain Mackenzie, in the top row, extreme right, was my stepfather Donald's brother, killed in the war. Third row - Bella Mellon, Hector Bell, unknown, Ross Clark, Harry Urquhart, James Simpson, Daisy MacPherson. ?Isobel from Alness, Pauline Oliver. I think this is the only picture I have seen of my father, who died in 1974, with a full head of hair. He blamed his baldness on his pilot's helmet during the war. Hello Linda, it is nice to see my mother's brother Ian MacKenzie. Lately there have been quite a lot of photos of the Mackenzie's blackpark on the Library. I hope you have enjoyed seeing them. Hello John - yes, it was the Blackpark photo (picture #956) that gave me a lovely surprise and started me off looking at the site. Have you seen no.97 in Tain Through Time of the Quebec Bridge? It says the mason was "a Mr Mackenzie" - probably your grandfather. Donald, my step-dad, used to say what a good mason his father was and that various things he'd built were still to be seen. By the way, I know he's Dan at home, but "Donald" is how he introduced himself to my mum and when she discovered nobody else called him that, he wouldn't let her change it. So I'm stuck with it too! Hi Linda - it was good to see this photo and to see a picture of my stepfather's (Angus Mackenzie)brother, Ian. Angus spoke of Ian often. I guess, your stepfather, Donald, and my stepftaher, Angus, being brothers - makes us related in some obscure way Linda!!! My dad is Davie Beaumont - I love this picture and would love to see/know any others.